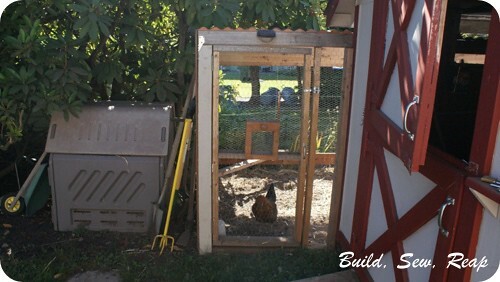 Now that we've had chickens for a few months, I feel like I can finally write up some lessons I've learned about what does and doesn't work for us. Here's a post about our coop so you can see where we are starting from. Below I've highlighted a handful of things that are lacking. First, a big problem is what I call poop dust. 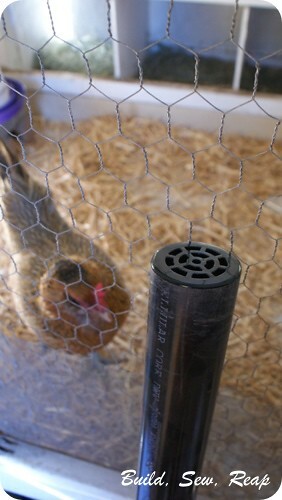 I'm on the search for a plug in outdoor safe exhaust fan that would pull at least some of the dust out of the coop and send it elsewhere. It really builds up in there even though I scoop out the poop every other day. 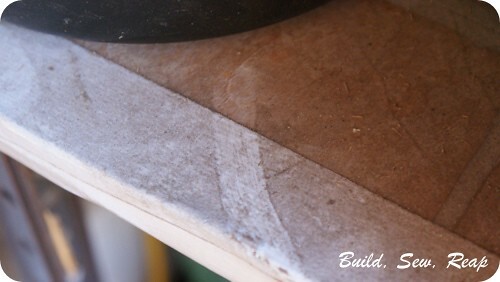 The dust still accumulates. We need a drain in the floor of the coop for the big cleanings. I have the pieces for this project but haven't gotten around to it. 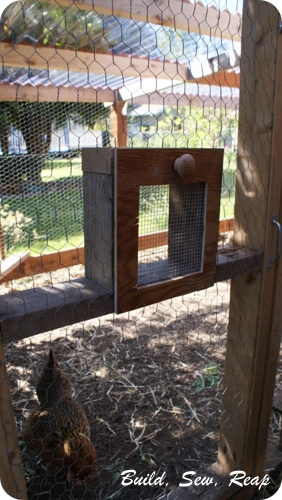 I'm glad we didn't do peel-and-stick linoleum but instead I glued down one huge sheet but when I hose out the inside of the coop every few months, I find that I have to then bail out the water and dry everything off with a rag. I wish I had put a scrap of 2x4 at the door to their yard so they couldn't kick quite so much of their straw out into the yard. 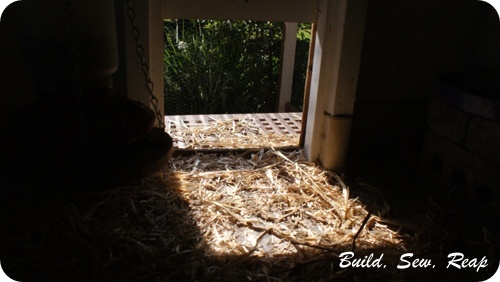 We end up with a lot of straw out in their yard and while it doesn't really hurt anything, it seems like a waste of perfectly good bedding. So, now on to the things that ARE working for us. 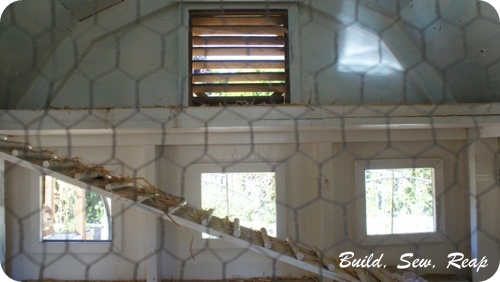 I love having storage underneath the coop and having the coop up high. 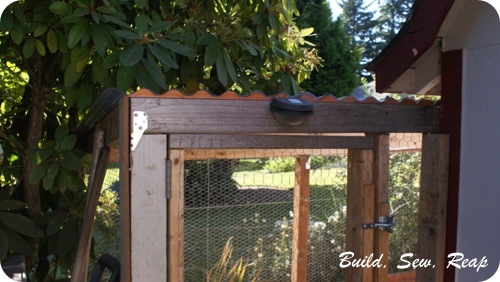 It really makes it easy to change out food and water to have those a few feet up from the ground and to have the food in a big storage container just under the coop. 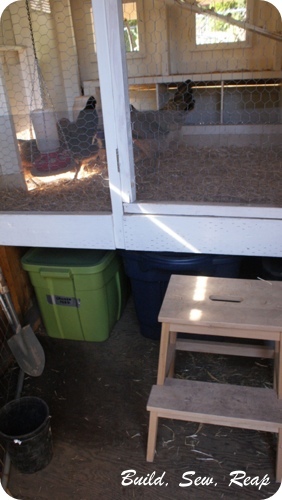 I did have to add a step stool to make climbing in and out of the coop for cleanings just a little easier. It also works well to have everything in big Rubbermaid containers so that critters aren't tempted to move into the shed to eat up all the food. The huge container I have for the extra straw is actually on wheels too so it slides in and out of the under-coop storage area really easily. I read a lot about having ample ventilation and I feel like I added just enough. We have windows that open and close (although we've left them open since the weather turned nice) and vents that let a breeze flow through but that have screens to limit bug invasions. 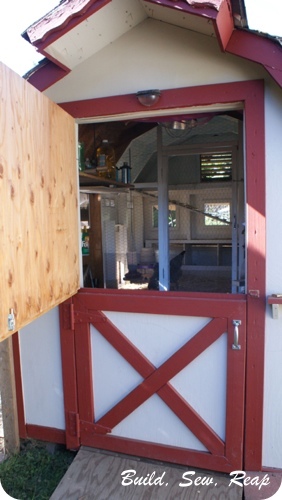 We also happened to have a dutch door already on the shed so during the nice weather, we open the small windows and the top of the dutch door and get a nice breeze moving through the coop. 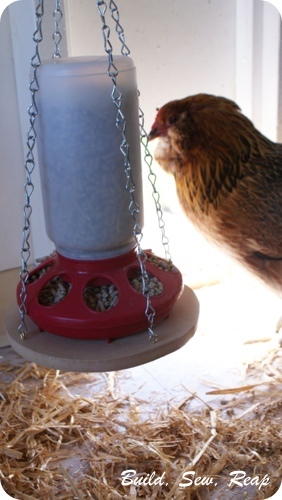 The hanging feeder I made has really cut down on wasted food from a tippy feeder. The design is holding up well too. 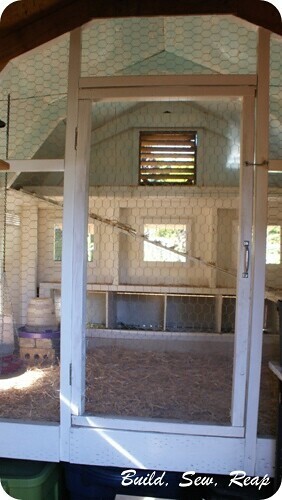 I'm glad I made the coop tall enough that I can stand inside to clean stuff. I'm only about 5'6" tall so I didn't need a ton of room but it is nice that I don't have to crawl around inside but can step in and stand up to scrape and scoop out the poop. We talked about where to put the nesting boxes and although they're on the opposite side of the shed from our back door, it is wonderful to have easy access to them from outside their yard and coop. We've only had one incident where the Snickerdoodle left the nesting box door open and LaVerne escaped but she didn't get far before someone noticed and put her back. We love the treat door within the main door. It sure makes it easy to toss table scraps and weeds in for them to munch on. The girls like to dig holes in their yard so they can roll around in the dust so I'm really glad we buried the chicken wire walls nice and deep. We also piled rocks and scrap concrete at the base of the chicken wire before back filling with soil. I feel like they're safe from predators as well as from escape. 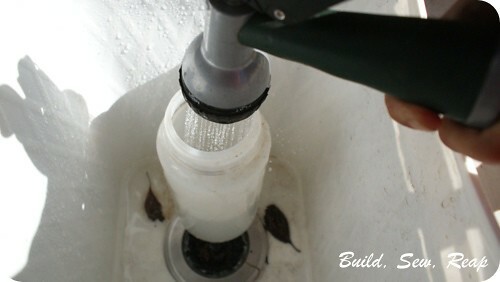 Having the compost bin nearby is a huge convenience. When I collect the poop, I put it in a small bucket then immediately empty the bucket into our compost bin which is right outside the shed door. This has been really handy. Every single time I refill their water bowl, I think how thankful I am for the outdoor sink that's just steps from the coop door. This has worked out really well. A hose would also suffice but the sink is even better. We had talked about cutting back the branches on the tree that hangs over the coop yard but I'm really glad we didn't. 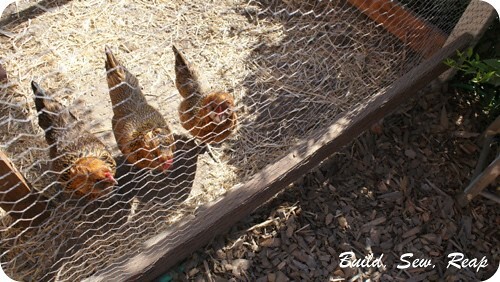 The chickens really enjoy having a bit of shade on warm days. I often find them digging holes and taking cool dust baths under this tree. You can see a solar light above the door there too. While I wouldn't include that as a must-have, I do really like the welcoming glow it puts out when the sun goes down. It's just a simple fence post light I purchased at the local box store. So there you have it, just a few things we do and don't like about our coop setup. Overall I'm thrilled with what I was able to learn from the internet in such a short time right before we adopted our girls. 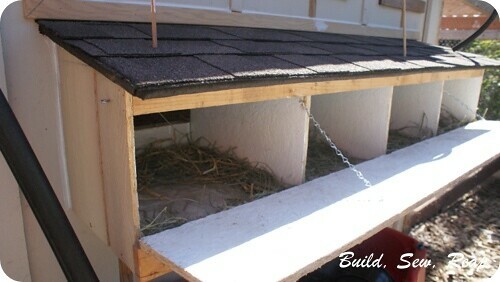 The advice I compiled was very helpful and our coop design has suited us very well. 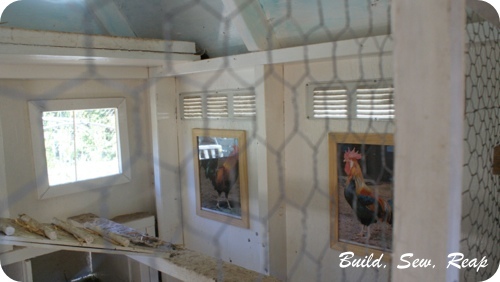 I can't believe the 'high style' your chickens live in! Beautiful coop and it looks like you've thought of everything. 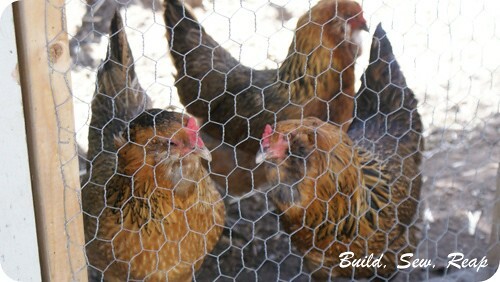 My friends with chickens have lots of problems...I'm passing your post on! They're going to have a long happy life with us. I'm already looking to add a couple more chickens though. We were doing fine until the little dude decided he wants an egg every day and I'm sure it's only a matter of time before he wants 2. Right now the Snickerdoodle gets most of the eggs with an occasional one or two going to my husband. Luckily I don't even like them so I'm not fighting for them every day too.